Organized fire fighting has a long history in Maysville. In January 5, 1854, the first fire captain was nominated by the town council to serve a one-year term. He served until January 4, 1855. In 1857, fire captains began a two-year appointment, but reverted back to the original one year chartered appointments in 1862. Maysville fire captains were equivalent to the modern day fire chief. The fire captains led a volunteer brigade, which generally consisted of residents who lived near the fire apparatus. The fire apparatus in this period of history were generally constructed on wood reinforced wagons and were paddle pumps in which four sturdy citizens would manually operate a reciprocating pump, which forced water through an 11/2 inch hose to a nozzle. In 1845, James Morrison, with the help of the citizenry and the Maysville town council, purchased what is thought to be the first fire apparatus, and promptly named the fire pump “Pat Lyon”. Later, that name was changed to “The Phoenix”. In 1854 the second fire apparatus was purchased for the Neptune Fire Pump Company. The Neptune Fire Company was the name of the brigade of volunteers. This apparatus took on the name of “Little Red”. These manual pumps did not have any water storage, so the community was dependent upon either natural bodies of water (river, river swales, backwater, ponds) or, in the late 1830’ to early 1900s, the community built fire wells. Fire wells were generally constructed of masonry and/or rock, and were nothing more than holding areas for water. The general construction was approximately 8 feet wide and 14-16 feet deep. Natural storm water would be diverted to these wells, and the overflow was diverted back to the natural drainage system. The fire wells were constructed on the corners of the most inhabited streets in Maysville. (i.e., Market and Second, Market and Front, Market and Third) Very often, private owners of businesses and buildings would construct their own water storage areas specifically built for fire suppression. The office of Maysville’s fire chairman lasted until January 2, 1911, at which time Maysville’s first fire chief, Ed Hite, was appointed. Chief Hite served until January 3, 1916. 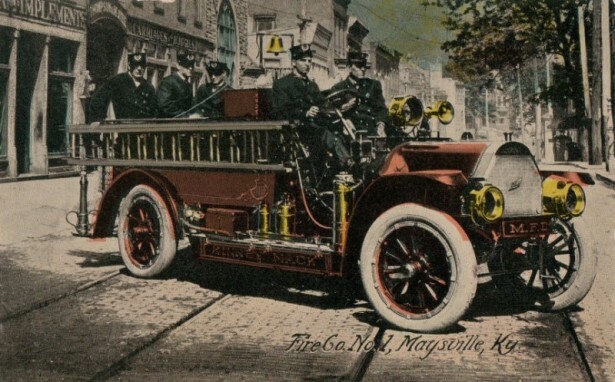 During the spring of 1910, the Maysville town council ordered a new fire truck from the Knox Fire Truck Company in Boston, Massachusetts. Records are unclear, but it is said the fire truck was shipped from Boston to Maysville via freight train in the fall of 1910 (truck dedicated October 18, 1910). Maysville fire brigade volunteers were at the time unaware of how the truck functioned. 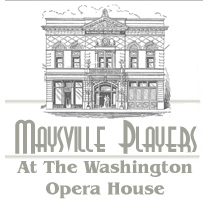 Therefore, a team of horses pulled the fire truck to the Maysville fire station, which was located in an existing building next door to the Washington Opera Theater. For official purposes, we have always used the year 1910 as the originating year of Maysville’s first paid fire department. While there is some confusion, simply because Maysville had a volunteer brigade in both 1910 and 1911, Maysville had both volunteer and paid departments. The tradition of naming fire apparatus after one of the community volunteers began in 1910 after the purchase of a Knox power driven fire engine. The “Kinney Mac 1” was named for Kinny McClanahan who was a volunteer in the community and served on the Washington Volunteer Fire Department. Legend has it that Kinney Mac was always the first fireman at the scene and the last to leave. 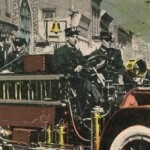 The second power driven fire engine was purchased in 1914 and called “Uncle Bob”. The “Uncle Bob” was named after Robert Ficklen Sr., who was known as the “Father of the Maysville Volunteer Fire Department”. Until the 1930’s, Maysville’s city hall was located in the first floor of the Mason County Courthouse facility in an area now occupied by the Mason District Court. The location of the fire department was in close proximity to the town council chambers. In the 1930’s, the city acquired the L&N depot – the current home of the Maysville Fire Department. With this move, a celebration occurred at the same approximate time as the Maysville centennial in 1933, whereupon the Maysville town council ordered a 1933 General from St. Louis, Missouri – a state of the art fire truck and pumper. 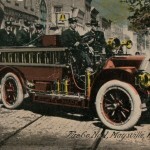 This replaced the 1910 Knox as the community’s primary fire suppression equipment, and became known as the “Kinny Mac II”. The 1933 General served as the primary truck until 1947, when the city purchased a 1947 Seagraves fire truck and pumper, which was appropriately named “Kinney Mac III”. In the following years the city purchased a 1964 Seagraves ladder truck and a 1969 Mack fire truck. At the present time the fire department a 2009 77 foot Ferrara ladder truck and two Pierce International custom pumpers. One is a 1995 and the other is a 2002 model.